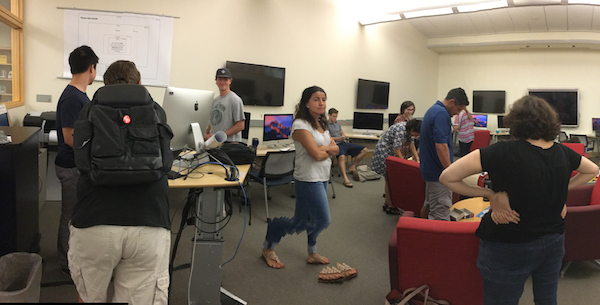 A busy day in the lab as what seemed like the entire Spanish School descended on the Wilson Media Lab to print posters. The Digital Media Tutors were on-hand to offer support, and informed us that closer to 50 had showed up. They said they were very proud of the plotter, that it was handling the workload very well. This entry was posted in LIS Staff Interest on August 10, 2017 by Joseph Antonioli. Did these posters get put on display somewhere? Some posters were used in a Spanish School class assignment. There are posters on display in McCullough, between the Grille and Wilson Hall, these may be the ones people are looking for.